(1957) Ricardo Montalban, Carmen Sevilla, Gino Servi, Jose Guardiola. IN COLOR. 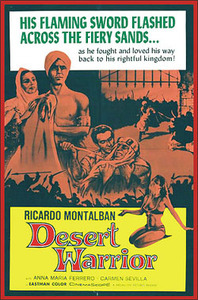 Ricardo plays the son of a powerful Arabian sultan. When the sultan is murdered by a paid assassin, Ricardo’s prince must fight to regain his rightful place on the throne. Desert Warrior has lush, exotic locales and has an overall big scale feel to it. Montalban, years before Star Trek and Kahn, gives a fine performance as the rugged prince; Servilla is certainly a beautiful princess and plays well next to Montalban. For years this film was largely seen only in black and white. Our master was made, however, from a very nice color 16mm print.